Camas shoots. April 4, 2019. 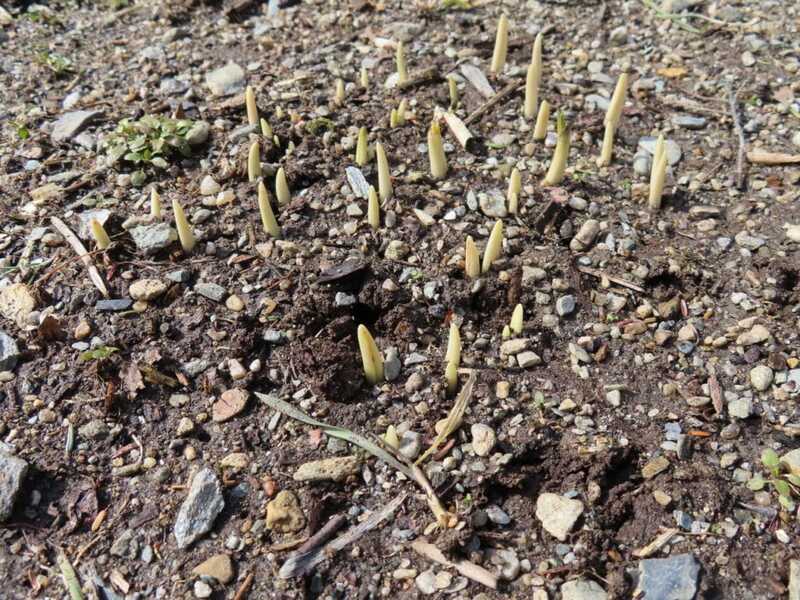 Mount Washington — Meeting the casual gaze, the landscape appears dormant, but up close, even near patches of snow and ice in my hill town garden, white shoots of camas stick out of the otherwise bare, brown earth like miniature ivory tusks or canine teeth. Pale green day lily leaves, sheltered amidst detritus, lean toward the Sun. Dark green crumpled tops of perennial onions show themselves in a south-facing border. Every day it seemed that the alternation of warm days and freezing nights would end; nights would moderate, allowing the ground to thaw. Although the soil surface is friable, my digging fork is stopped at a barrier of ice about 5 inches down. To the maple syrup maker, the transition from winter to spring is a distinct season: We watch the thermometer for below-32-degree nights followed by sunny days when the temperature rises above freezing. The weather seems to connect to our own respiration that, in turn, connects us to the movement the weather brings about in maple trees. We respond by accepting the tree’s gift of sap. Last Thursday, the 4th, under sunny skies, I peered under the lid of a sap bucket to observe the clear, colorless stream of liquid drip from the tip of the spile, or spout. Before sunrise on the 5th, I was pleased to find about half a gallon of sap with a thick rim of ice around a center that was shinier than water and slightly viscous. It was 24 degrees. I lifted the ice out and dropped it into an empty pail, to use instead of water for cooking. The rest went into another pail, to boil for syrup. Two gallons of sap – 32 cups – boils down to a scant cup of syrup. Sugary water freezes at a lower temperature than water. By removing the ice, which is water, there is less water to boil off. Last Friday was probably the end of maple sap run: the beginning of all-out gardening season. 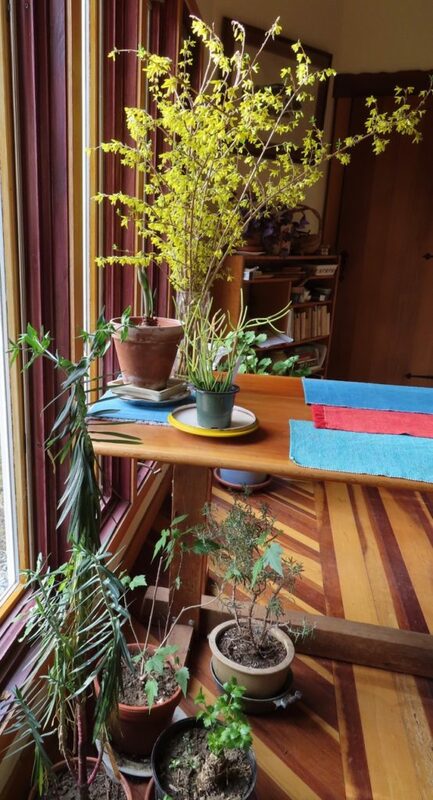 Meanwhile, it is spring indoors when stems of forsythia, cut two weeks ago, are flowering. They do not require sunlight, just warmth. A late-blooming amaryllis, too long in a cold room, rises to the Sun. A motley collection of plants taken in for the winter is holding on until they can be hardened off to grow outdoors for the season. I found spring and summer gardening well under way in a heated hoop house at Indian Line Farm in South Egremont. 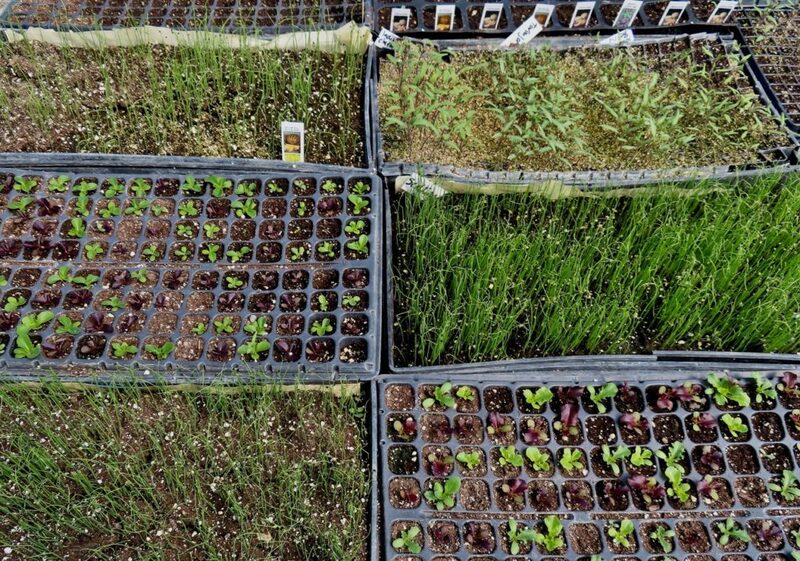 Elizabeth Keen introduced me to her flats of seedlings, pictured here, and to long rows of foot-tall, flowering tomato plants. Find Indian Line at farmer’s markets and inquire about subscribing for a whole summer and fall of produce and flowers by going to https://www.indianlinefarm.com/.